Looking to grab a new Android phone but don’t want to shell out the cash? Well, Kineto has you covered with a new contest. As you may remember, Kineto is responsible for bringing WiFi calling to Android, and it’s looking to be a pretty big deal. 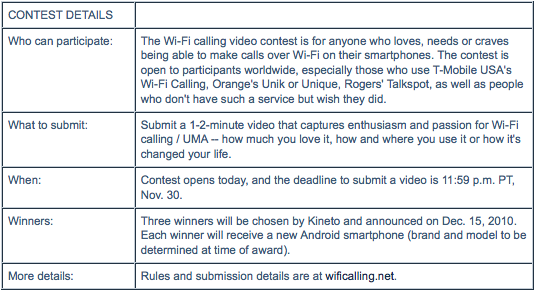 Their contest will give you the chance to win one of three top-of -he-line Android phones and all you have to do is produce a short video explaining why you love WiFi calling and such. Simple, right? Good luck! ← And The T-Mobile 4G Attack Continues, Do You Like it? It looks like this covers the Galaxy S phones, any idea of when will be available for the Vibrant? what apk? Kineto apk?? anyone with the apk??? is that possible???? unfortunately developers have messed around with the app (apk) on the vibrant and it doesn’t work… something deeper with the kernel is the theory. So it seems for now that it will not work until kineto and tmo decide to offer it to the vibrant,, im guessing in the froyo update… whenever that happens. In looking at the press release, its a Froyo app- so we would need to wait until that’s available on the Vibrant – hopefully it will be in T-Mobiles 2.2 update. I believe its either OTA or built into the handset. Nothing to do with Froyo, nothing to do with the kernal and nothing to do with the radio. I was one of the few that toyed with this app for weeks and again just the other day. I have tried everything under the sun to get the app to load and work on several devices, but the way the app is installed and something extra that is needed is what is halting progress. As of now the only way to get this on your device is if T-Mobile releases it, and unfortunately they are being there normal selves and jerking people around. The G2 saw that the update was good to go three weeks ago but T-mobile yanked it and screwed everyone over(yes they just rereleased it). Our only hope now is that the app hits more phones before the end of the year, but T-Mobile wont release any info. How about offering wifi calling for ALL Android phone through marketplace?